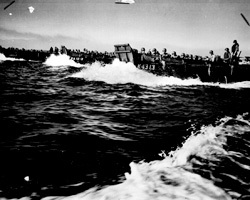 A line of Coast Guard landing barges, sweeping through the waters of Lingayen Gulf, carries the first wave of invaders to the beaches of Luzon, after a terrific naval bombardment of Jap shore positions on Jan. 9, 1945.” PhoM1c. Ted Needham. NARA photo.